Internet Brands October 30, 2018 Comment Now! My 2019 Porsche Panamera GTS test car came with ceramic brakes, rear-wheel steering, and a frighteningly thick booklet explaining the driving laws—significantly, the penalties for breaking them—in Bahrain. The words “jail term” appeared often enough to dissuade me from ordering the V-8’s cavalry into action on public roads. 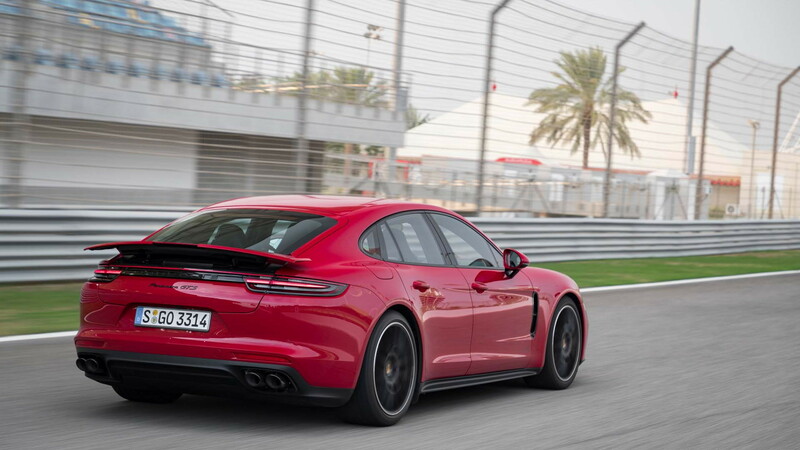 In a way, the threat of getting consigned to a Bahraini prison cell for a few months ensured I experienced both sides of Porsche’s latest land missile. 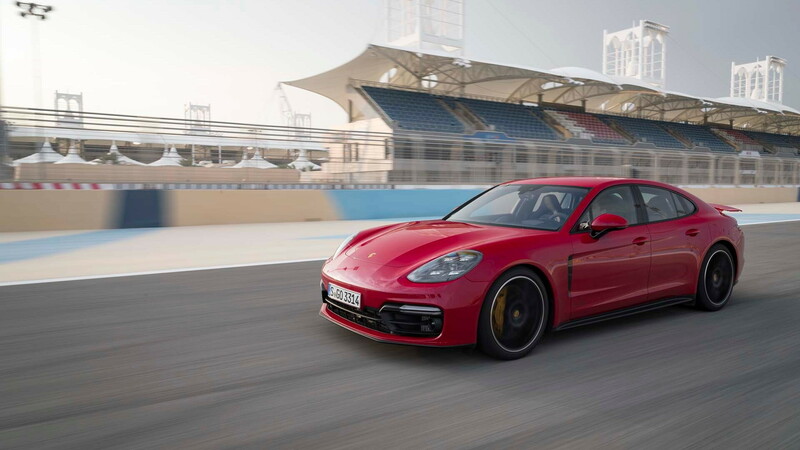 The first-generation Panamera GTS bellowed down the German autobahn with a naturally aspirated, 4.8-liter V-8 engine. In hindsight, it was the last specimen of its breed. Unveiled in October 2018, its replacement surfs the displacement downsizing wave with a twin-turbocharged 4.0-liter V-8 engine to make 453 horsepower between 6,000 and 6,500 rpm and 457 pound-feet of torque over a broad 1,800- to 4,500-rpm range. More torque in more places is a clear benefit of going turbo; it’ll give the naysayers something to chew on. Blame lawmakers if you miss the old engine, though. Thomas Friemuth, vice president of the Panamera line, told Motor Authority his team embraced forced induction mainly to comply with tightening emissions regulations, especially in the European Union. Porsche couldn’t build a sport sedan with a naturally aspirated, large-displacement engine while remaining on the legal side of pollution laws. “If it was possible, we would have done it,” he said. The 4.0-liter’s horsepower and torque figures proudly stand 18 and 73 higher, respectively, than the outgoing 4.8’s. That’s 113 horsepower per passenger if you order the Panamera as a four-seater. The turbocharged engine spins the Panamera’s four wheels through an 8-speed dual-clutch transmission. Friemuth noted about 75 percent of the V-8’s power goes to the rear wheels in normal driving conditions, but the split constantly changes as factors like road conditions, the driving mode selected, the steering angle, and the G-forces recorded by the bevy of on-board sensors enter the equation. Every drop of the torque can rush to the rear wheels if needed, too. Alternatively, the front axle can receive up to 70 percent of it, though that mainly happens if the rear wheels completely lose traction, like when driving on an icy road. If you really want to know where the power goes, Porsche programmed a gauge that shows the real-time torque distribution into one of the screens of the instrument cluster. And, regardless of how power is distributed, the V-8 sends the Panamera GTS from 0 to 60 mph in 3.9 seconds and pushes it all the way to 181 mph. With the words “Bahraini prison” relentlessly echoing through my mind, I selected the humble Normal mode to head to a cluster of man-made, fish-shaped (no joke) islands off the country’s southeastern coast. The blend of city and highway driving demonstrated the Panamera’s competence as a commuter. The V-8 doesn’t sound utterly angry, but it does seem a little annoyed, a constant reminder that this is a sportier version of an already sporty car. The sport seats’ side bolsters serve the same function. The active air suspension (no steel setup for the GTS) delivers a comfortable, compliant ride suitable for longer trips. Meandering through rows of double-parked Toyota Land Cruisers with ’90s-licious side decals vividly reminded me the Panamera is about as wide and as long as a short-wheelbase BMW 7-Series. An armada of cameras that send footage to the touchscreen in the center console helped to prevent me from adding creases and obtuse angles to the curvaceous, 911-inspired body panels. The Panamera’s slippery shape largely keeps wind noise in check. The GTS is lighter on its feet than the Turbo and more high-strung than the 4S. It’s quick, too, and I appreciated the sharp throttle response while passing or pulling away from a light. 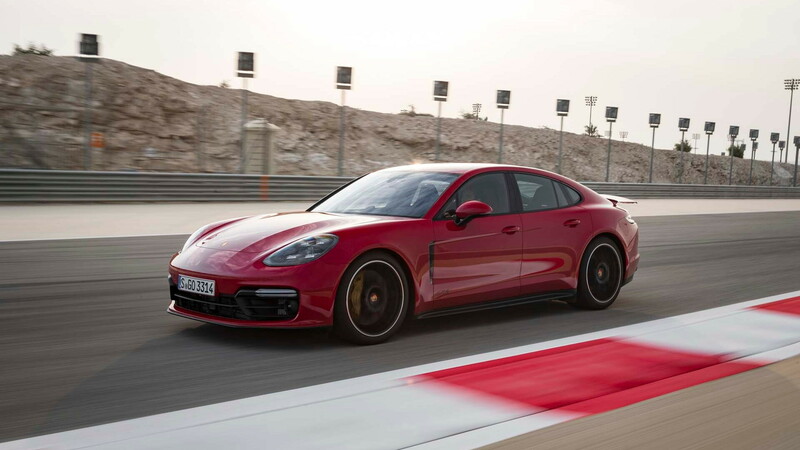 While the GTS isn’t unhappy cruising through the desert with the adaptive cruise control safely set to the speed limit, it certainly wouldn’t protest if the pace picked up. The route led to Bahrain’s Formula One track, a 15-turn safe haven where I could freely explore the other side of the GTS’ personality. 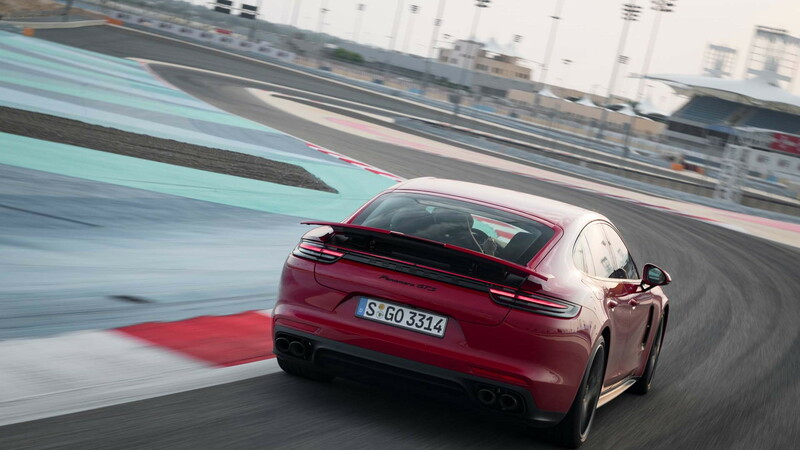 In Porsche-speak, the GTS acronym denotes a car that skillfully blends the comfort you want in a daily driver with the performance you need to credibly hit the track. Every GTS must excel in those two areas to be deemed worthy of the storied badge, which Porsche introduced in 1963. Even the family approved, Ikea-friendly Sport Turismo model has to be two-faced. Given the choice, that’s the one whose keys I claimed before walking to the pits. I chose the mode aggressive drive mode: Sport Plus. Sport Turismo is a fancy name for what’s essentially a station wagon with a shapely body that goes easy on the eyes. It took only a few corners to discover the Panamera Sport Turismo GTS handles like a much smaller, nimbler car. It’s energetic and approachable. The optional rear-wheel steering system works its alchemy on the Sport Turismo by reducing its turning radius at low speeds. The all-wheel-drive system juggles the V-8’s torque to coerce the car into a bend before shooting it out. It’s possible to leave the transmission to its own devices but, on the track, it’s best enjoyed when shifted manually using the steering wheel-mounted paddles. The next gear up or down is much closer than it ever could be if Porsche fitted the GTS with a manual gearbox. Surprisingly linear for a twin-turbocharged engine, the V-8 happily rocketed the Panamera to 140 mph on the track’s main straight. The huge ceramic brakes scrubbed off speed steadily and predictably in anticipation of the first corner. Porsche gifted the GTS with a phenomenal amount of grip and balance, especially considering it weighs about 4,400 pounds. The trade-off is that the traction control system intervenes more often than I’d like it to. It’s possible to turn it off entirely, though I wasn’t allowed to during my time on the track. A car like this deserves a more liberal setting between full-on and full-off to increase the bond between car and driver. What if you don’t want to bond with the Panamera? It’s OK; it’s not clingy and it won’t judge you for it. Like the other Panamera variants, the GTS’s cabin is a pleasant place to relax. The infotainment system is displayed on an easy-to-use, 12.3-inch high-resolution screen, and it’s the first Panamera fitted with a head-up display, a glaring omission up until this point. The cockpit doesn’t force its tech on the driver or make the car feel like a sports sedan for spacemen, though. The driver sits low with the ignition switch on the left side of the steering wheel, where Porsche enthusiasts expect to find it, and every part of the interior is made with upmarket materials like leather, Alcantara, and real aluminum (or, optionally, carbon fiber) trim. There are so many ways to configure the Panamera GTS that I was surprised not to find a sauna on the list of extra-cost options. Porsche does offer traffic jam assist semi-autonomous driving technology for times when all hope is lost and there is truly no conceivable reason to try bonding with the car. 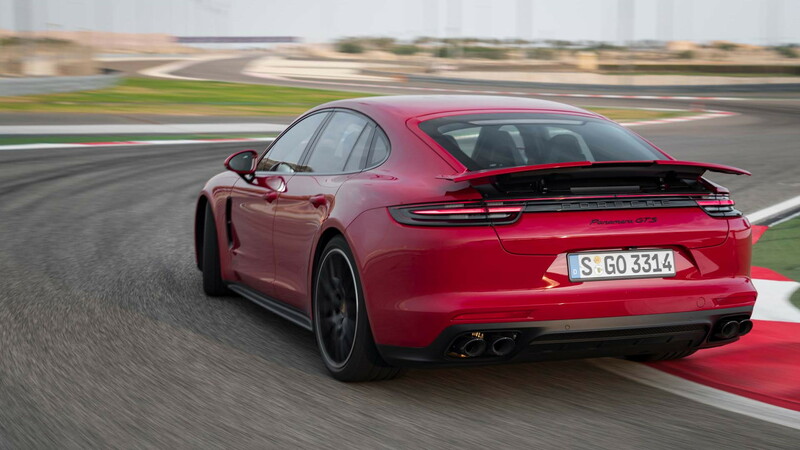 Well-mannered on the road and fluent in hot laps, the GTS is the best-driving variant of the immensely capable Porsche Panamera. It will keep this distinction for the foreseeable future, unless Porsche unexpectedly breaks with tradition and lets its racing department spawn a Panamera GT3 RS. But the final caveat is pricing; I can’t turn a blind eye to the fact that the GTS really isn’t cheap. The price starts at $128,300 for the standard Panamera and $134,500 for the Sport Turismo model before Porsche adds a mandatory $1,050 destination charge. Porsche provided travel and lodging to Internet Brands Automotive to bring you this firsthand report.